Over 2 billion people use social media. Find out how to get their attention. More and more, social media is the secret sauce when it comes to marketing your brand and products—after all, it’s where the people are. Another notable stat: 89% of U.S. respondents said they use Facebook several times a week or more, and 81% said the same about Instagram, according to a AudienceProject survey. TL;DR: Social media is a great opportunity to reach customers, but it’s a crowded landscape. To create social media posts that drive results, the first step is to up your content game. We’ve summed up the essential steps to creating content that people click. Great, thumb-stopping social media content has 2 components: visuals and copy. Good images or video definitely increase engagement, and they endear your brand to customers. They can also keep customers from quickly swiping past your post and missing your message. Good images or video definitely increase engagement, and they endear your brand to customers. They can also keep customers from quickly swiping past your post and missing your message. Get stellar art for your social posts. You don’t have to be a photographer to use stock photo websites like Pexels and Unsplash, which offer great images, many of them free. And if you do want to improve your product photography skills, Shopify has a great DIY guide. Avoid images with too much copy on them. Did you know Facebook takes this into account when approving posts for ads? If you’re not sure if your image has too many words, here’s a handy checker. Use more photos with faces in them. People-heavy images get more engagement on Instagram, and they can humanize your brand. Say cheese! Make a video. With the advent of smartphone cameras, it’s never been easier to hit record. Facebook’s algorithm prioritizes it, and it can be a fun way to show off your wares. Plus, as livestreaming has hit the mainstream, consumer expectation for social video has shifted. Videos that feel rougher around the edges can feel more native to social platforms. Give it a shot! Make your post phone-friendly. If you’ve worked hard to create great images or video for your social media posts, make sure they look good on mobile devices. 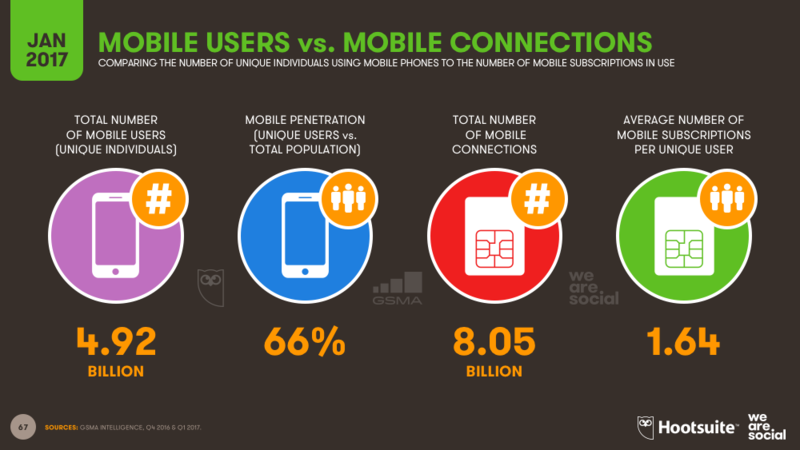 Almost 3/4 of the global population uses a mobile phone, and nearly 80% of time on social media is spent on a mobile device. Stay inspired. Keep a list of brands or organizations whose social media imagery you love, and check in with them from time to time. Tell them “why.” Consumers are bombarded with ads and products, so you’ve gotta convince them why your stuff is what they’re really after. Make sure your copy tells them why they need what you’ve got.